Here’s what we started with- which is totally functional but not inspiring… and there’s things we did need to change. We need to address the lack of storage and I’m pretty excited to change the way it looks. If you want to see more of our house ‘Before’ photos, you can find those here. Let’s talk about the things we need to change and the things we got a bit of a head start on and then we’ll talk about the plan! The first thing you’ll notice is that she IS actually sharing a bedroom. 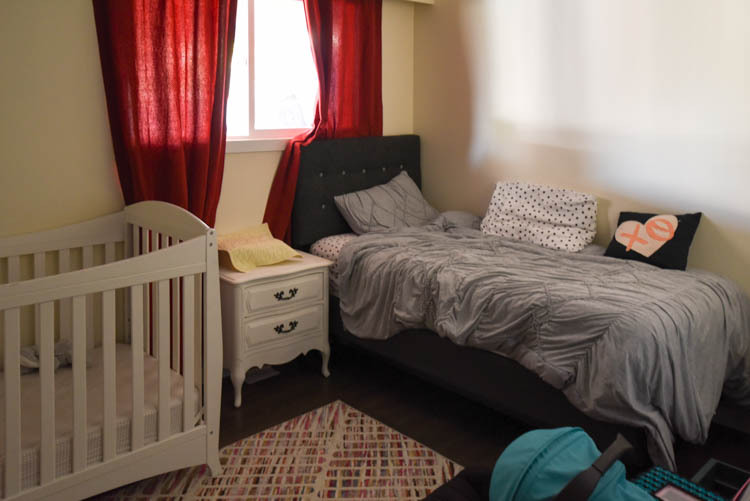 We’re moving Calder (the baby) into the boys bedroom once we finish the flooring in there so she will actually have a girls room by the end of this! The biggest change in terms of work that we’re going to have to do is move that window. We are closing in our carport to a garage right now also (yes, on top of the kitchen remodel and on top of this room…) so this window would be in the garage. We’re moving it to the wall that the bed is on in these photos. That means we’re taking out the valance and patching the hole where the window is… as well as cutting in a new one. I’m a bit concerned that we were late ordering the window but hoping it will get here in time! I’m thinking these kiddos might spend the next month sharing with their brothers while we wait for that window. The bit PROBLEM with the window? Well, for me? That wall with the bed on it also has the water meter on it. Which can’t be moved. So the window has to be incredibly off centre and there is no room for two matching sized windows that comply with fire code. So we’re going to need to get creative on how to make that window look normal(?) with the bed centred under the window like we’d hoped. The first things that we’ve done is replace the floors and the doors/trim. We shared a sneak peek of that in this post right here. This is the same creamy paint colours just with those red curtains pulled back and looooots of light. Also notice how I’m not showing the top corner of this door? We can’t trim it out because of… VALANCE! Haha, that thing has to go. It’s first on my list, but I’ve got to move the kids both out of here first. 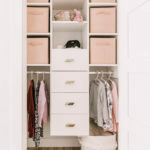 If you read this post, you’ll know that we chose Peach Bloom from General Paint for this room. Aubrey’s been asking when I can paint it for her ever since! The trim is called Expert White also from General paint and is the same white we’re using throughout our house. 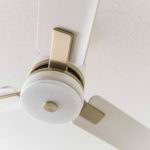 So I had been planning to partner with Emerson Fans to replace the dated ceiling fan in the boys room with a much nicer ceiling fan just to help circulate the air with so many of them in there. BUT I’m so glad we didn’t jump on that because having boys in bunk beds… and a ceiling fan in a room? Not happening in my house for much longer. They’re monkeys. 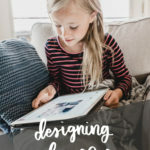 But since we had the catalogue for Emerson Fans sitting on our coffee table, you know that Aubrey had already picked her favourite and started planning her big girls bedroom around it! She’s totally a mini-me, you guys… and she has great taste. She chose this one (Ideal Eco in Satin White and Gold) and I couldn’t agree more with her choice. The funny thing is… she really needs it because a couple weeks ago, her light just flat stopped working. Not the lightbulb, just the whole fixture. Every morning she asks to borrow my phone to use as a flashlight to make her bed (I feel terrible, but I knew that fan/light was ordered!). Tomorrow, I’ve promised her we’re headed shopping to buy her a bedside lamp. Okay, guys. Here’s where I HAVE NO CLUE. Not really NO clue… but nothing finalized. 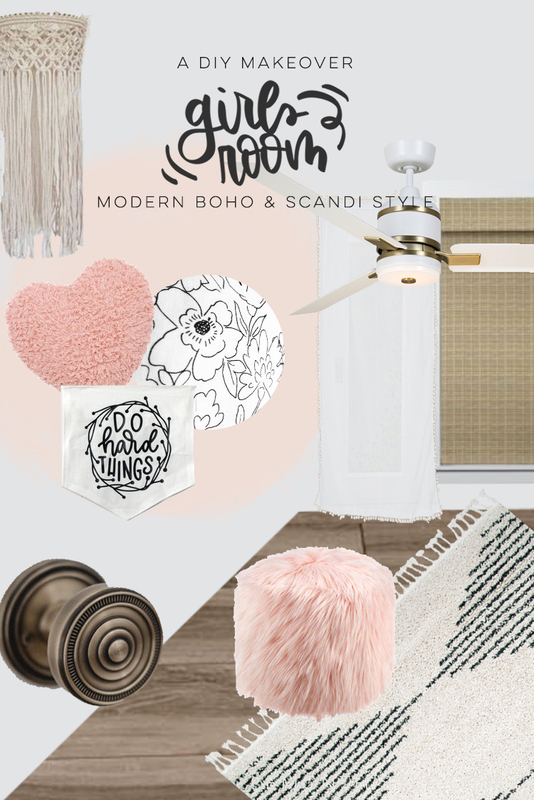 She loves the pink furry pouff, she loves the heart pillow, she has a doll bed we want to make over, she has bedding and a bed frame from her last room makeover (all grey and not very girly)… so we’re going to be dreaming hard and shopping a little to pull this one together. We don’t have a big budget for the space other than the big things that we’ve done (windows, doors, floors, lights, paint… so everything). So decor is going to be creative, friends! I would love to get her bedding that suits this girly theme more than the grey. And I would really love to recover that dark charcoal headboard with a more feminine fabric. Shane thinks I’m crazy on both counts (I probably am) but think those would totally transform how the room comes together. Did I mention a rug would be amazing? And beautiful window coverings! I have done some research. As of right now (and as of the design board), here is our wishes to making this space happen. We already have that macrame… not that EXACT one, but the one I made for this tablescape. It’s SO dirty from being outside, but she’s asked to have it in her room so we’re going to try clean it up and get it looking pretty again for her. I do have one set of sheer white curtains with pom pom sort of detailing I picked up at Homesense. I like them, but would like to give her more privacy than that so am dying over these woven wood shades from Blinds.ca. I ordered some samples and am planning on doing these through our whole house if we can swing it. She loves that fuzzy looking heart shaped pillow and faux fur ottoman so. darn. much. They’re both from Bouclair and we actually found SO many things there that this girl is in love with. That pennant is one that I made that I think I love having in her room more than she does- but I love the message it reminds her of every day. The fabric swatch in that little grouping is the fabric we picked up for Aubrey’s doll bed makeover! This doll bed is special to me since my Papa made it for me when I was a kid. I’m happy that she gets to use it as well, so we’re giving it some love with some fresh sheets and probably paint as well. I picked up three different beautiful fabrics from Fabricland a while back for that project if you’re super observant on my Instagram stories, you might have seen! Recognize that beautiful door knob? We already installed those babies for Aubrey. 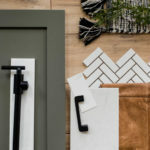 They’re these ones from Grandeur Hardware and they are SO GORGEOUS, you guys that I wrote a whole post about them. Even more so in person- if that’s possible. Last but not least, I did throw a beautiful rug in this design board because I’m pulling for a new rug for her to play barbies on. This one is has a moroccan pattern which plays really well with the boho theme but because it’s straight lines and a little minimal as well it definitely works with the scandi vibe we’re hoping to add in. It’s safe to say I’m in love with it. It’s from Rugs USA right here. Alright… that’s the plan! And the non-plan? The what the heck are we doing plan! 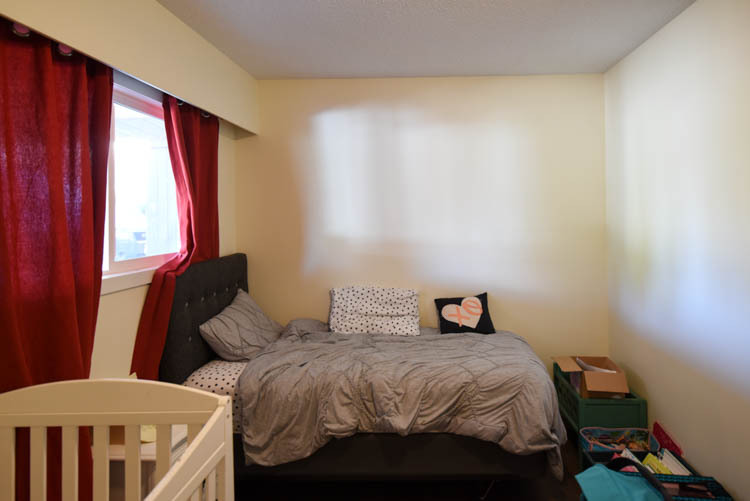 I hope you’ll join me on this 6 week makeover and wish me luck as we take on moving the window, drywalling and changing pretty much every square inch of this room. And then decorating it ;) What do you think of the plan so far? Can’t wait to see how you transform the space girl! Hi Colleen! 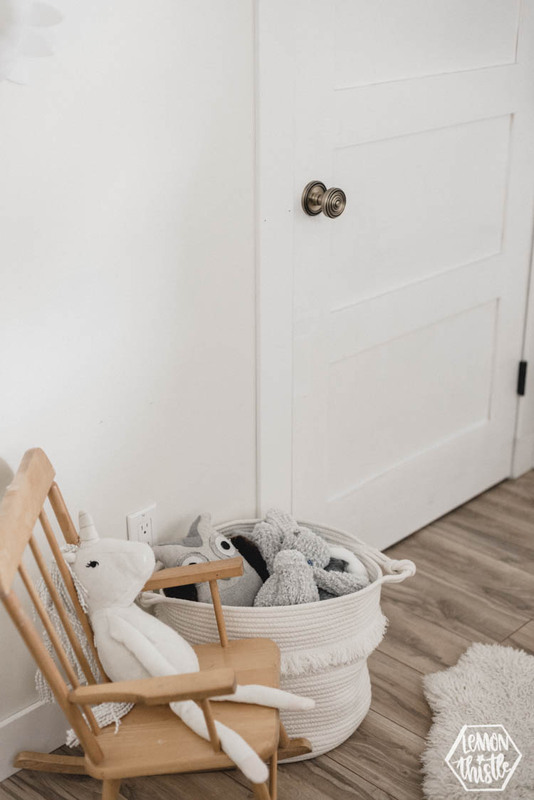 I love your plans and am looking forward to following along…I’m redoing my older son’s room into a shared hyggeligt (cozy) Scandinavian room for the ORC, so we might have some similar vibes going on! Those sound like great updates and love the mood board!! Excited to see! Stopping in from the ORC this morning. I can’t wait to see what you do with this space. I love that one of her requests was a ceiling fan – such mature tastes! 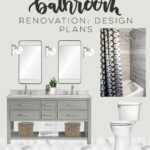 I loved your bathroom reveal so I’m sure this one is going to be fantastic too! 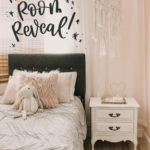 Girls rooms are so much fun, can’t wait to see how this one turns out! !